Brazilian Americans (Portuguese: brasilo-americanos, norte-americanos de origem brasileira or estadunidenses de origem brasileira) are Americans who are of full or partial Brazilian ancestry. There were an estimated 371,529 Brazilian Americans as of 2012, according to the United States Census Bureau. Another source gives an estimate of some 800,000 Brazilians living in the U.S. in 2000, while still another estimates that some 1,100,000 Brazilians live in the United States, 300,000 of them in Florida. According to the 2016 American Community Survey, There are a total of 42,193,781 foreign born persons in the United States. From the 42.2 million immigrants, 350,091 are Brazilians, corresponding 0.83% (350,091/42.2million) of the foreign born population. The United States Hispanic Chamber of Commerce (USHCC) is the largest Hispanic business organization in the United States. It was founded in 1979 and is headquartered in Washington, DC. A Stateside Puerto Rican, also ambiguously Puerto Rican American (Spanish: puertorriqueño-americano, puertorriqueño-estadounidense), is a term for residents in the mainland United States who were born in or trace family ancestry to Puerto Rico. Canarian Americans are Americans whose ancestors came from the Canary Islands, Spain. They can trace their ancestry to settlers and immigrants who have emigrated since the 16th century to the present-day United States. Most of them are descendants of settlers who emigrated to Spanish colonies in the South of the modern US during the 18th century. The Canarians were among the first settlers of the modern United States; the first Canarians migrated to modern Florida in 1569, and were followed by others coming to La Florida, Texas and Louisiana. UnidosUS, formerly National Council of La Raza (NCLR) (La Raza), is the United States's largest Latino nonprofit advocacy organization. It advocates in favor of progressive public policy changes including immigration reform, a path to citizenship for illegal immigrants, and reduced deportations. Nuyorican is a portmanteau of the terms "New York" and "Puerto Rican" and refers to the members or culture of the Puerto Rican diaspora located in or around New York City, or of their descendants (especially those raised or still living in the New York area). This term could be used for Puerto Ricans living in other areas in the Northeast outside New York State. The term is also used by Islander Puerto Ricans (Puerto Ricans from Puerto Rico) to differentiate those of Puerto Rican descent from the Puerto Rico-born. Spanish (/ˈspænɪʃ/ ( listen); español) or Castilian (/kæˈstɪliən/ ( listen), castellano) is a Romance language that originated in the Castile region of Spain and today has hundreds of millions of native speakers in the Americas and Spain. It is a global language and the world's second-most spoken native language, after Mandarin Chinese. The history of Mexican Americans, Americans of Mexican descent, largely begins after the annexation of parts of Mexico in 1848, the nearly 80,000 individuals then living in the U.S. became full U.S. citizens. Large-scale new migration augmented their numbers during the 1910s, as Mexico was torn by a high-casualty civil war. Until the 1960s, most lived within a few hundred miles of the border, although some resettled along frail lines from the Southwest to the Midwest. More recently, Mexican Americans have diffused throughout the U.S., especially in the Midwest and Southeast, with the largest numbers in California and Texas. In the past hundred years Mexican-Americans have campaigned for voting rights, stood against educational, employment, and ethnic discrimination and stood for economic and social advancement. At the same time many Mexican-Americans have struggled with defining and maintaining their community's identity. The Congressional Hispanic Caucus (CHC) is an organization of 38 Democratic members of the United States Congress of Hispanic descent. The Caucus is dedicated to voicing and advancing, through the legislative process, issues affecting Hispanics and Latinos in the United States and Puerto Rico. The CHC was founded in December 1976 as a legislative service organization of the United States House of Representatives. Californio (historical, regional Spanish for Californian; plural: Californios) is a term for a Hispanic person native of California, who is culturally or genetically descended from the Spanish-speaking community that has existed in the Californias since 1683, of varying Criollo Spaniard, Mestizo, and Indigenous Californian origin. Alongside Tejanos and Neomexicanos, Californios are part of the larger Chicano/Mexican-American/Hispano community of the United States, which have lived in the American Southwest since the 16th century. The United Farm Workers of America, or more commonly just United Farm Workers (UFW), is a labor union for farmworkers in the United States. It originated from the merger of two workers' rights organizations, the Agricultural Workers Organizing Committee (AWOC) led by organizer Larry Itliong, and the National Farm Workers Association (NFWA) led by César Chávez and Dolores Huerta. They became allied and transformed from workers' rights organizations into a union as a result of a series of strikes in 1965, when the mostly Filipino farmworkers of the AWOC in Delano, California initiated a grape strike, and the NFWA went on strike in support. 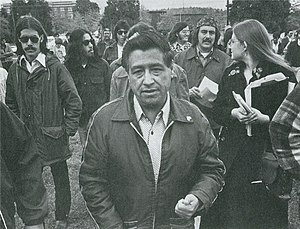 As a result of the commonality in goals and methods, the NFWA and the AWOC formed the United Farm Workers Organizing Committee on August 22, 1966. ... that Erinea Garcia Gallegos, one of the first college-educated Hispanic women in Colorado, was appointed postmistress of the city of San Luis by President Franklin D. Roosevelt? Do you have a question about Hispanic and Latino Americans that you can't find the answer to? For editor resources and to collaborate with other editors on improving Wikipedia's Hispanic and Latino Americans-related articles, see WikiProject Hispanic and Latino Americans.